You can examine ’til your heart’s content, you won’t find anything special. Heavens, if I let folk examine things they’d spend the whole game doing it! With what do you want to light the torch? Say things in full, bedlamite! even when it’s clear the game is capable of understanding but just chooses not to. Unlock the door with what? If you want to unlock the door with keys, why not say so? Just to please me? To switch to general theory for moment, I’ve occasionally run into the philosophy that error messages are a good thing and understanding too much will somehow harm the player’s general ability to interact. I’ve never subscribed to that. I feel like if the parser is capable of understanding, it should go ahead and do what the player wants, perhaps indicating what the standard syntax is for future reference. I haven’t run into anybody while playing MUD1, although I know there exist other players because I’ve seen objects moved to other positions. Still, I feel like a digital archaeologist visiting ruins. I have to keep in mind while poking at design aspects the intent is for there to be other players roaming around. Roy Trubshaw’s original map of the starting area, from Richard Bartle’s website. For instance, the first area I wandered into was a graveyard maze. There are tombstones with descriptions colorful enough I wonder if they are player-created (maybe previous players who made wizard or witch have the honor?). You are standing on a badly paved road with a cemetery to the north and the home of a grave-digger to the south. An inscription on the cemetery gates reads, “RESTING PLACE OF LOST SOULS”. You are lost in a misty graveyard. There stands before you a black tomb with crossed axes emblazoned on it; inscribed on the tomb is: “Druss the wizard”. A headstone to the east bears the inscription, “OK, so maybe the dragon WAS a bit of a handful…”. However, I’m not sure yet if there is a sensible mapping process, because leaving the graveyard and entering again led me to an entirely different room to start. In normal circumstances this would be another maze to sigh about, but with other players there’s an extra dimension. The graveyard was put to great use by Gwyn the Wizard in his mortal days while he was working his way up to that exalted rank. It’s quite easy for novices to wander in accidentally, and it takes them a while to find how to get out (you type the direction OUT!). So Gwyn would wait at the the start of the maze, slaughter anyone who wandered in, then run deeper in and go to sleep. Going to sleep gets you back lost stamina points from fights, and is usually very dangerous in case anyone stumbles across you. But who is going to find you in a maze? I’ve played MUDs before where formless, undescribed rooms became sites of memorable events or epic confrontations. A MUD is less obliged to make every room “mean something” in itself when the players can impose their own meaning. Also, after enough wandering there was a message about being able to pry open graves. I’ll have to explore further. The lurker in the maze wouldn’t be possible without a combat system. Since players with more points tend to be more popular targets for those with an urge to kill, they have better attributes than those they started with. MUD generates a random set of characteristics for you when you start – your “persona”. These are strength, stamina and dexterity. The other Dungeons & Dragons abilities are up to you, so if you’re thick in real life you’ll be thick in the game. The abilities are used mainly in fights, where stamina is how much damage you can take, strength determines how much damage you do when you hit, and dexterity is your chance of hitting. They crop up in other places too; for example dexterity is used to see if you manage to steal from another player successfully. As far as I can tell so far, there are no weapons/armor/other combat augmentations. There is a spell system which may be usable in combat but I haven’t found any spells yet. It also may be the intent is for the variety to come from multiple players targeting each other at the same time. From the stories I’ve heard MUD1 was never a free-for-all but rather a place where individual players would snipe at each other, but for the current evidence I’m not sure. I obviously haven’t tested the inter-personal combat, but here’s my battle against a zombie. *You narrowly duck a pathetic punch from the zombie. *Your weak punch is no problem for the zombie. *You comfortably duck a limp cross by the zombie. *You smite the zombie with a weighty thump! *The vigour of a punch by the zombie sends you sideways. Summoning strength you bear up, and charge back into the engagement. *Your wild return lunge at the zombie is easily ducked. *You effortlessly duck a tame cross from the zombie. *You beat the zombie with a vicious punch! *You are wounded by the energy of a blow by the zombie! Gritting your teeth you concentrate, and start into the slaughter. *Your counter swing sends the zombie reeling! Your last cross did away with the zombie! Notice the whole thing runs on automatic after typing KILL ZOMBIE. It’s possible to flee but otherwise the sequence above was entirely non-interactive. 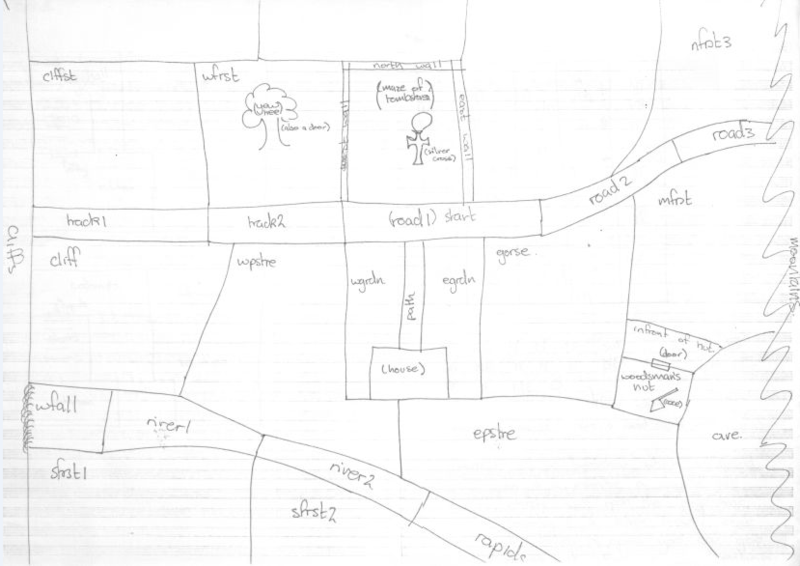 Zork had a central house, and MUD1 feels obliged to follow suit. My house map so far; click for a larger view. I am not certain the items on the map are in their “starting places”, due to mystery players moving objects. On the map is my first solved puzzle, which simply involve moving a bookcase to expose a staircase going down. At the bottom was the previously mentioned zombie as well as a door I can’t get through yet. The door has runes on it that kill me if I try to read them. I can’t think of any other MUD I’ve played that has this kind of deathtrap, but it does fit in with the late 70s text adventure genre. I did manage to get through the door via a hint from a tome (“DOOR: be polite when entering.”) where I found a “sorceror’s room” with a large number of objects that I haven’t got a chance to play with yet, because there was a potion that killed me upon drinking it (in real time via delayed reaction; I left the keyboard briefly and returned to find my character dead). Attempting to go from the second floor to the attic causes another instant-death. The cupboard appears to be bereft of any shelving, there are scratches on the wall but there is nothing here which can explain them. A heavy stepladder leads upwards to the ceiling. The cupboard is very small, and as you ascend the ladder you suddenly realise that you are running out of air! Try as you might, you cannot break your way out of the place, although you bash at all the walls, and the ceiling and floor. Eventually you suffocate. Now you know how the scratch marks on the wall were made! I am fairly certain the idea of going for “wizard” is dead. Richard Bartle himself chimed in my last post to call MUD1 “essentially a museum piece” and the scoring seems to be engineered toward social interaction. I also still haven’t found anything resembling a treasures list and will probably pass on that as objective. Well, puzzles can be a pain when multiple players are there to mess things up, but they might work solo? I do find his remark puzzling, though, because I’m fairly sure the door-opening was a puzzle. Perhaps he means elaborate logic puzzles? We’ll see, I guess. Multi-User Dungeon, or MUD (referred to as MUD1, to distinguish it from its successor, MUD2, and the MUD genre in general) is the first MUD and the oldest virtual world in existence. It was created in 1978 by Roy Trubshaw at Essex University on a DEC PDP-10 in the UK, using the MACRO-10 assembly language. 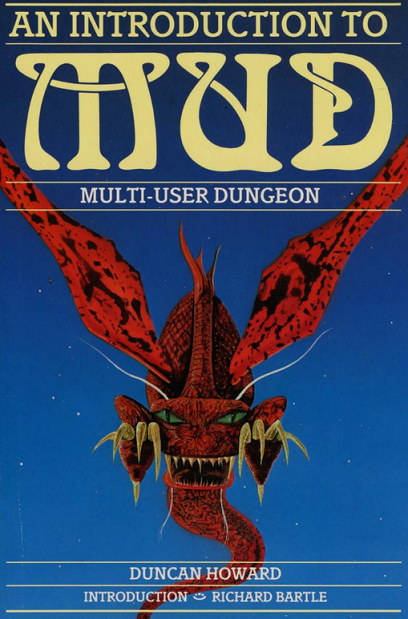 He named the game Multi-User Dungeon, in tribute to the Dungeon variant of Zork, which Trubshaw had greatly enjoyed playing. 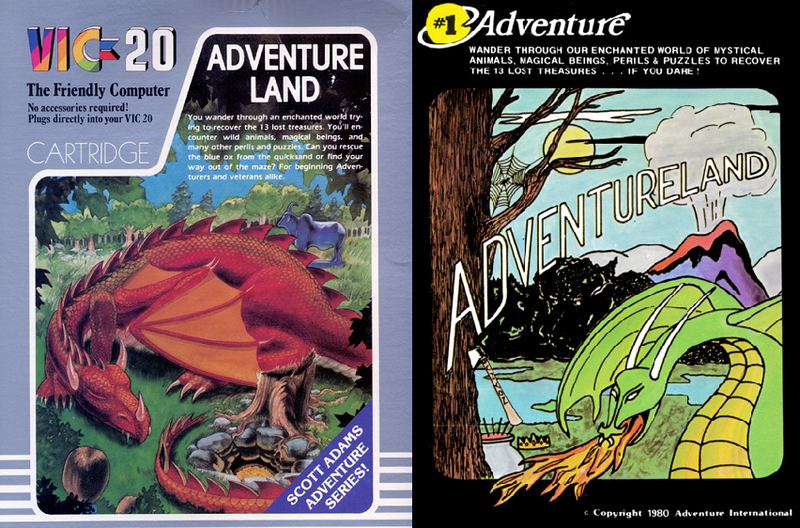 Zork in turn was inspired by an older text-adventure game known as Colossal Cave Adventure or ADVENT. Even though the interactive fiction community regularly communicates on ifMUD, there seems to be little intersection between them and the MUD community. Given MUD1 was inspired by Zork, I figured it’d be worth a try. It’s somewhat cosmic that MUD1 is even available. Development started in 1978 and was handed from Roy Trubshaw to Richard Bartle in 1980. It was licensed by CompuServe in 1987 where it remained until 1999 before being revived a year later on British-legends.com. You can play it, right now, if you go here. I have only tried wandering around once so far, and have only run into one other player (idling in the starting room). Whether this is going to be a full multi-player experience or a place quiet enough I’m essentially going single-player, I don’t know. I’m also not sure how long I’m going to play this thing, partially because I have no idea what I want my objective to be. I’ve worked out four possibilities. #3 means you can essentially “grind” your way to victory from combat. I think? I also think objects reset to an extent you can redo puzzles and get points that way. Hence becoming immortal might not represent a full gameplay experience, but I don’t have enough knowledge of the game to tell for sure. b.) The “more advice” section also lists a series of “quests” for novices to try. Trying to do all the above might be impractical, too easy, or just the right amount to feel a sense of accomplishment. c.) There are treasures that can be converted for points by dropping them in the swamp. (The players call this “swamping”.) A “find all the treasures” objective might be manageable, but I have yet to find a full list. d.) Richard Bartle has Roy Trubshaw’s original maps, so it is possible to play MUD1 in essentially the 1978-1979 version. The areas are The Narrow Road, The House, The Maze of Tombstones, and Beneath the Yew Tree. This kind of goal would likely be just a quick visit. At the moment I’m just going to wander with “d” as a goal and see what happens. If I only can manage a post or two, that’s fine. It turns into a full-length game, I’ll write about that too. I had three treasures left to go. Their method of extraction is spoiled below. not only serves as a tree-chopper, but as a magic item. The humble lamp used throughout as a mere light source has a second use as well. There’s a bit of scrawl in the maze that says “ALADIN WAS HERE”. A glowing Genie appears, drops somehting, then vanishes. The most direct route isn’t too helpful. Bear is so startled that he FELL off the ledge! Poor bear. I guess he was evil too? The last treasure required the ultimate gesture of defeat, the walkthrough. I did not feel bad about spoiling this time. So yes, RUB LAMP works to get one treasure, but a second RUB LAMP gets another treasure. This is what I have called Bad Frustration. I could see someone trying a second RUB LAMP if they’re in the process of lamp-rubbing, but after there is no plausible way to think through the answer. If I ever codify Advice for Puzzle Makers at some point, one of the rules would be this: Think about if your player is unable to solve a puzzle. Is there a clear route to get on the right track, or will it require enough luck that the player will feel like they have wasted their time? You want a response of “oh!” to a puzzle solve (even if it had to be looked up) not “oh…” with a head-shake of frustration. A glowing Genie appears, says “Boy you’re selfish”, takes something and then makes “ME” vanish! There’s a variety of commercial covers, but these two are my favorite. Video Game Obsession for the VIC-20 cover, Ira Goldklang for the TRS-80 cover. I can’t in good conscience recommend Adventureland to modern audiences. Not because it’s impossible to have fun — I did — but because Scott Adams himself got better as he went along; not every game was a treasure-hunt. The actual minimalist style does have a soothing meditative quality to it, although if you’re just wanting to experience that you might try J. Robinson Wheeler’s ASCII and the Argonauts; it has the same modern-feel-with-retro-style that many indie-games shoot for these days. Since text adventures are inherently retro, that’s possibly the only way to achieve the effect. When people talk about being “stuck” in an adventure game, usually they mean there is some specific puzzle they can’t get by. I’ve got exactly one puzzle I know I am stuck on. I’ve some *ROYAL HONEY* that will make the bear happy and cause him/her to fall asleep, but since the royal honey is a treasure itself that causes me to lose points. The extra problem is, I’ve got more points missing than just one treasure worth. I don’t know where else the other treasures might be. So I am clearly “stuck” somewhere but I have no idea what I should even be doing. 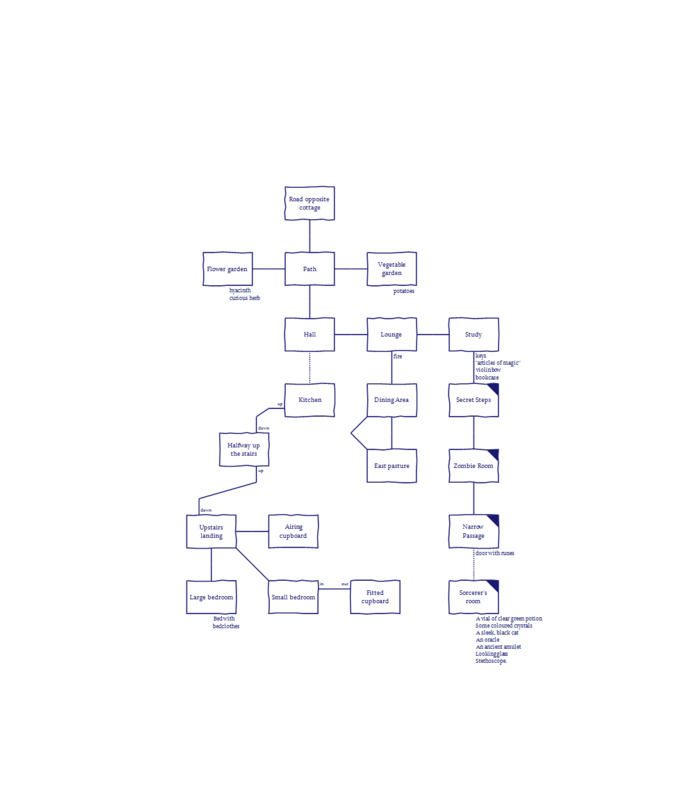 The map I have so far, excluding the maze. Click the image for a PDF version. There are only 3 ways to wake the Dragon! One puzzle involving an explosion I may not have worked out without the HELP command. * A sequence later I needed to drive away the dragon to steal its eggs. I feel somewhat bad about that. I guess the dragon is evil so that makes it ok? * There’s a tiny maze. Scott Adams must have felt obliged to provide a maze. It took all of five minutes to map. I am in the memory chip of a COMPUTER! I must have took a wrong turn! but at this point I suppose I need to question everything. * If you go down from the ledge near the swamp you end up in Hell. Whoops. I don’t think there’s a treasure here, but given the Acheton trick I’m not going to rule it out. Also known as the Concours de Fictions Interactives Francophones 2015; voting is now open. The three entries are here. Since these things often pass by the English-speaking interactive fiction world without a trace, I decided to try translating the opening of each. I took liberties with grammar and accuracy is not guaranteed. WARNING: This game contains scenes of blood. The day was long and exhausting. You’re content to be finally alone in your room to enjoy a well-deserved rest. All is quiet about you: this promises to be a tranquil evening. You are lying in bed under a quilt. Everything is quiet. The dim glow of your bedside lamp casts strange shadows while gently illuminating the room’s furniture and objects. Your room’s window (facing your bed) is open. You can also see a guitar, a bedside table, a wardrobe (which is closed), a chair, and a desk. It is winter and night is beginning. Street lights that line the street reflect the windows. A few cars rumble past noisily on the pavement. Couples walk by, dressed in thick overcoats and hats. A chestnut vendor reads a newspaper by the light of a fire. The imposing Teatro delle Muse appears at the corner of a street, grabbing your thoughts. You enter through a small door set into a much larger one made of raw wood. The door closes behind you. The theater entrance is narrow with high ceilings. There are imposing crude wooden doors with a small opening for the staff. To the north there are grand encircling windows of gold which suggest an enormous hall. Carpets are lined with purple velvet cords, and two corridors lead visitors to the top of some stairs. You can see a man of powerful stature. The curtains close. Just before they shut, she takes a fleeting look in his eyes and tries to smile at him. It is in vain. Her lips do not move. Not just there; despite his efforts, his face also remains frozen. The curtains are closed now. The wires that hold her up fall, followed by the wooden cross. “At the next performance, I will,” she promises (as always). The show has just ended. She knows from experience she still has some time until the next performance. She has time meanwhile to rest, and to collect decorative things that are damaged and might otherwise be discarded. Over time she has made a collection of memorabilia.